Whether you're a full-time trader looking to make a living or a part-time trader looking to make some extra money, the foreign exchange (forex) market has what you desire--the potential to make sizeable profits and 24/7 accessibility. But to make it in today's forex market, you need more than a firm understanding of the tools and techniques of this discipline. You need the guidance of someone who has participated, and prevailed, in this type of fast-paced environment. Raghee Horner has successfully traded in the forex market for over a decade, and now, in Thirty Days of Forex Trading, she shares her experiences in this field by chronicling one full month of trading real money. First, Horner introduces you to the tools of the forex trade, and then she moves on to show you exactly what she does, day after day, to find potentially profitable opportunities in the forex market. 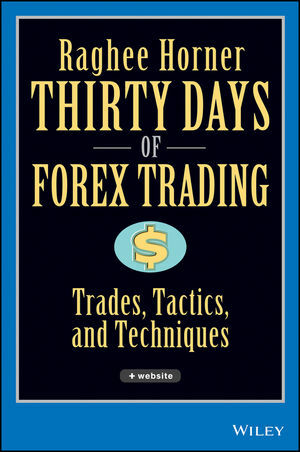 Part instructional guide, part trading journal, Thirty Days of Forex Trading will show you--through Horner's firsthand examples--how to enter the forex market with confidence and exit with profits. RAGHEE HORNER is an accomplished trader with more than fifteen years in the futures, stocks, and forex markets. She is the founder of EZ2 Trade Software and lead trader of Trade Direct FX. Horner has written more than 100 articles on trading, has been featured in Technical Analysis of Stocks & Commodities and eSignal's "Trading with the Masters." She is a sought-after speaker who has conducted seminars throughout the United States, Canada, the Carribean, and Asia as well as a popular presenter at the Forex Trading Expo and the Online Trading Expo. Horner is the author of Forex Trading for Maximum Profit (Wiley). Visit her at www.raghee.com. Introduction: The Mechanics of Trading. The Thirty Days of trading. Day 1. Tuesday, January 31st. Day 2. Wednesday, February 1st. Day 3. Thursday, February 2nd. Day 4. Friday, February 3rd. Day 5. Monday, February 6th. Day 6. Tuesday, February 7th. Day 7. Wednesday, February 8th. Day 8. Thursday, February 9th. Day 9. Friday, February 10th. Day 10. Sunday, February 12th. Day 11. Monday, February 13th. Day 12. Tuesday, February 14th. Day 13. Wednesday, February 15th. Day 14. Thursday, February 16th. Day 15. Friday, February 17th. Day 16. Monday, February 20th. Day 17. Tuesday, February 21st. Day 18. Wednesday, February 22nd. Day 19. Thursday, February 23rd. Day 20. Friday, February 24th. Day 21. Monday, February 27th. Day 22. Tuesday, February 28th. Day 23. Wednesday, March 1st. Day 24. Thursday, March 2nd. Day 25. Friday, March 3rd. Day 26. Sunday, March 5th. Day 27. Monday, March 6th. Day 28. Tuesday, March 7th. Day 29. Wednesday, March 8th. Day 30. Thursday, March 9th. Conclusion: A Follow-Up and the Wave/CCI Setup. Conversation with Raghee Horner: Interview by Linus K. Ahnis.